Cassia lives in a future world where the government controls all aspects of life, from your job to the number of kids you can have to the date of your death. Most importantly, the government is also responsible for choosing your perfect Match. People are usually Matched with others from different cities throughout Society, so Cassia is surprised when her best friend’s face comes up on the screen during her Match ceremony. She’s even more surprised, however, when a second face briefly appears in a “malfunction,” a face she also recognizes. I need to say, up front, that I can’t review this book in an unbiased way. Many of my readers know, but some new ones may not, that I wrote a book in 2008 called MatchMakers Incorporated, which had a eerily similar premise and very similar world-building to Ms Condie’s. 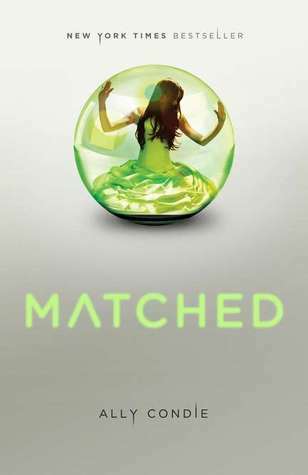 My book was out at agents when Matched was announced, and was actually rejected by some agents because the book was so similar in premise. It took me months to cope with this, and once I got to a stable level again, I took steps to try to make myself feel better about Matched. I talked to Ms. Condie, first through comments on her blog and later in person at BEA. I also got an ARC of the book and read it before I even left NYC. These things helped me process the situation, and will hopefully help me change my book around so that our two books can both comfortably sit on the market one day without crowding each other. Ally Condie is a very sweet person and I wish her all the best with this book. Selfishly, I actually want Matched to do well. Very well. There’s a good possibility that my book will never be picked up because of Matched, and if that’s so, these concepts and this world that was so intimate and dear to me – well, I want them to be out in the world, garnering support, becoming loved by readers. I was scared, when I started the book, that I would have issues with the writing or I would find the book shallow or hasty or any number of other things that bother me in books. I can’t tell you how great my relief was to find none of these things. The book is very well written. Great characterization, great world-building, great prose. It’s a bit on the surface-level-side of YA, where there’s more high concept than deep philosophy, but it works for this book. There’s tension and the book makes you want to keep reading. There’s a cliffhanger, but it’s not one of those books that end on such an abrupt note that you’re unsatisfied. It’s a good balance between closure and wanting more. I’m sort of at a loss on how to review the book, coming from my particular situation, but I do want to say that it’s good. I really enjoyed reading it, even if I wished I’d found the world Cassia lived in to be more different from the world I’d built. And of course, I have to admit it still hurts to know what might have been. At the same time, I’m really glad this was so well done. In an odd way, that comforts me. One more note: The cover of this book is absolutely fantastic, one of the best covers I’ve seen in a long time. Note: I originally read this book in May 2010 but held the review until the release date in November 2010. I no longer have the date of my original post, so I’m simply posting it on the date I finished reading. This entry was posted in 2010, Prose, Young Adult and tagged speculative. Bookmark the permalink.